At Cornerstone Homes, we believe in growing community, and nothing connects nature and neighbors quite like our Corner Patch Gardens. These special gardens help people develop skills and knowledge that could potentially change how we think about eating and exercise. Not to mention, they allow us to spend more time in the fresh air — think less treadmill, more tomatoes. We call them “part amenity, part happy hour!” Located in our Cornerstone Homes communities, the Corner Patch Gardens are maintained under the direction of a professional farmer, Sean Sheppard, owner of the Backyard Farmer. We sat down with him to learn a little bit more about him and his love of gardening. Tell us a little about your background! I started Backyard Farmer almost 12 years ago while a student at the College of William and Mary. To help pay for school, I took up a few jobs for professors, local homeowners, and business owners in Williamsburg. I had my own landscaping service in High School, taking care of neighbors lawns and shrubs and trees, so I applied that same knowledge and work ethic to my new "adult" surroundings to help pay for tuition. I have since evolved the company to do many things, primarily here in Richmond, but the same ethos and core concepts that I started with are still my priorities; high-quality work done by individuals who care about the end results. We are a small company and plan to stay that way! How did you get involved in gardening? Growing up on the Eastern Shore of Virginia, there wasn't a whole lot of work or recreational opportunities. In order to earn some pocket money, I started helping my grandfather care for his large estate-like garden. He was an avid horticulturalist, who focused primarily on bonsais and topiaries, so I gained a lot of experience pruning and shaping shrubs and trees and early on learned the great therapeutic and spiritual benefits of working outside. Of course, at the time, it was chores that I had to do (and none of my siblings or cousins had to do them), but as time went on, I truly started to enjoy it. How do you see the Corner Patch Gardens affecting our homeowner’s lives? In the 3 years since I have been working with Cornerstone, I see that their primary goal is to make the lives of the homeowners better. Corner Patch Gardens is a great example of that! These gardens offer a facilitated experience as well as an outlet for all Cornerstone residents who want to learn or participate in gardening. 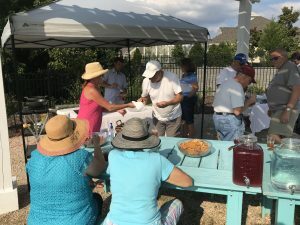 The folks at Cornerstone didn't just drop a garden and leave it, they made sure it was utilized and people enjoyed it, through our garden clubs and through our garden socials. I think it has yet to show its full impact, but every person I interact with while working in the gardens loves that they are there. How are you preparing the gardens now for Spring? First, we check the soil and add fresh compost and micronutrients. Any old plant material is either removed or chopped up and mixed into the soil (great for nutrients throughout the year). We then start sowing our seeds, checking the irrigation system and making sure everything is ready to grow. We have also started the first early pruning cuts on all of the fruit trees and shrubs in each of the gardens. It might be a few more seasons, but soon enough, homeowners will be able to enjoy a selection of fruits including blueberries, raspberries, blackberries, figs, apples, pears and more! What will be the first crops in the Corner Patch Gardens? Spring crops include lettuce, kale, collards, cabbage, radish, beets, carrots, peas and some herbs like cilantro and parsley. They will be followed shortly by things like squash, cucumber, tomatoes, peppers, and basil. I have been married for 5 years to my high school sweetheart, Maggie Gucwa. She is a Certified Behavior Analyst and works for the Faison School of Excellence in Richmond. We live on a 40 acre farm-in-the-making in the East End with 3 dogs, 19 ducks and 6 geese. When I am healthy, I love eating a mix of raspberries, macadamia nuts, and cottage cheese. When I am not healthy, I love pizza. The Giving Tree by Shel Silverstein is a children's book that I pretty much still read on a regular basis to recalibrate my sense of need from the world as well what the world needs from me. I think Forest Gump is my favorite movie. We hope you enjoyed learning a bit more about Sean and the Corner Patch Gardens! Come visit and be sure to take a stroll down to one of the gardens to see what’s sprouting! Better yet, join us at our monthly garden social events starting in May. 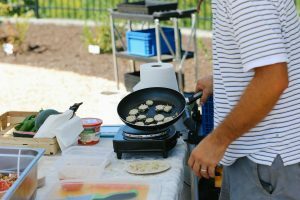 At these fun and popular events, you’ll learn some delicious new recipes, and most likely take home some freshly picked veggies! Check with your sales manager for upcoming dates.